Since the end of last year, the greenhouse horticulture sector has been troubled by the tomato brown rugose fruit virus (RoBRFRV). The virus has not yet been spotted in the Netherlands, but it is tested for. 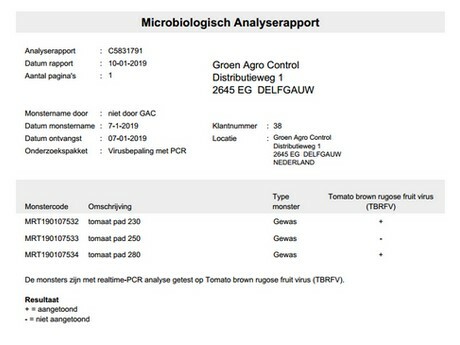 In December 2018, Groen Agro Control developed a quick DNA analysis for the tomato virus ToBRFBV. Ines van Marrewijk, Groen Agro Control: "It will be available from the beginning of January for real-life, reliable testing for ToBRFV." This so-called real-time PCR-analysis (Polymerase Chain Reaction) is specific for ToBRFV and very sensitive. "We have been processing samples of various customers for a while. The test seems to be working well on leaf material, water samples, and swipe samples from the surface, and customers get accurate results to apply necessary hygiene measures immediately." Specialists of Groen Agro Control are well aware of the seriousness of this virus and other viruses and viroids in the sector. "We can respond adequately to questions about monitoring advice or about hygiene measures in cultivation and work. Proper explanation is required to use the right samples and analysis for viruses and viroids. Randomly requesting a virus test like ELISA, PCR or variety determination could lead to incomplete results and insufficient actions." And sadly too many other viruses and viroids to mention here. Ines: "When a grower is not sure what to test for, I advise to always ask and then act."